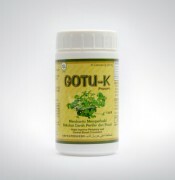 Gotu-K 100 caps - Improve memory. Blood circulation to the brain, calming psychological effect, skin repair and skin tissue due to injury. •Triterpenoids can revitalize the blood vessels so that blood circulation to the brain to be smooth, has a calming effect and improve mental function become better. •Asiaticoside repair and strengthening works to increase skin cells, stimulating the growth of nails, hair, and connective tissue. •High doses of saponin glycosides will produce the effect of pain relief. •Saponins contained in this plant has benefits such influence in inhibiting collagen production excessive scar tissue. Traditionally used to aid blood circulation. Take regularly 2 times a day @ 2 capsules.